Research has shown that 75-85% of people who leave their jobs do so because they feel that their managers and organizations do not value, or build relationships with, them. For leaders, building emotional connections with their teams is key to increasing engagement, inspiring creativity, and retaining top talent. Below, we discuss 5 key employee engagement ideas you can employ to connect with our team. Too often, taking the time to develop and nurture emotional connections takes a backseat to a laser focus on the next key milestone. What many technical managers fail to realize is that the time invested in these relationships will lead to increased success across the team, including engagement, productivity, and bottom-line results. 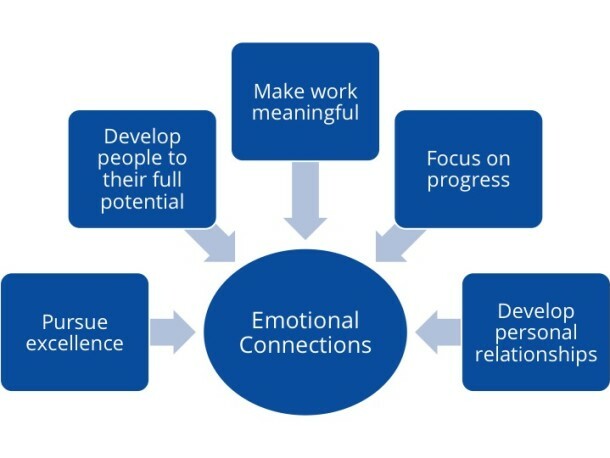 Emotional connections are the foundation for a successful team. But where does one start when aiming to build these relationships and perhaps more importantly how can technical managers adopt the new behaviors? Performex has identified five key behaviors to developing emotional connections with team members. By nature, people want to be a part of a winning team, and they gravitate towards greatness. When a leader sets high expectations and pursues excellence, the team members buy in and strive for excellence as well. What does excellence mean in terms of performance to your organization? Calibrate within the diverse needs of your company’s functions and clients. Compare your performance to industry benchmarks and competitors to develop a shared vision of excellence to work toward as a team. Based upon Performex’s own internal data, over 75% of our participants consistently rank the best leader they ever encountered as the individual that helped them achieve and grow the most. Let’s be clear - this person was not trying to be their friend but was the person that coached them, gave them tough challenging assignments and was not afraid to give negative feedback. Our results clearly demonstrate that even technical mangers with limited leadership skills and engagement challenges can make big strides by adopting this mindset and becoming better coaches and delegators. At the onset of our programs we frequently hear 2 statements: “Maybe that works for other leaders, but not me – I am way too busy”! And “I don’t have the time now – maybe next year after things calm down”. Most of the time these same individuals are poor delegators and do not understand coaching techniques. We can tell our participants have made big progress with their leadership skills when they report devoting approximately 30% of their time to developing their teams. The meaning behind some companies’ work is clear and very powerful – searching for a cure for cancer, for example – what an inspiring objective! While many organizations do not possess such a world-changing goal, good leaders help their people feel that their work is meaningful and important. At Performex, our proprietary methodology is designed to help technical managers and executives inspire their teams by identifying and focusing on the meaning behind the work. Last month, we discussed the importance of celebrating small wins. Linking daily progress to overall goals is the key to demonstrating to the entire team progress they are making as a work group. Seeing tangible proof of that progress enhances engagement and inspires teams. More importantly star performers are the most likely cohort to leave an organization they perceive as weak and failing. Many technical managers are so task oriented they perceive time not solely focused on the issues at hand as wasted. As a result they frequently do not spend the time to get to know their people and their lives, both at work and outside of work. How does one change this behavior and belief? We find through a mixture of scientific fact and introspection they too will see how important it is and was for their better managers to spend time to know them. Seeing this activity as an investment rather than a waste is repaid many-fold, as their team’s productivity levels will increase. When using these employee engagement ideas, remember to use empathetic communication techniques! Through high impact customized programs backed by the latest findings in NeuroLeadership and immersion workshops, Performex equips technical leaders with the skills and knowledge to develop highly engaged, connected teams that deliver superior business results. Contact us to learn more.